What we now call Germany was a collection of small principalities until Bismarck unified the country in the Nineteenth Century. That probably accounts for the several different traditions of German Music, ranging from Oom-pa-pa brass bands to Wagnerian Opera. In addition, there were several waves of German immigration into Pennsylvania, each one of which had its favorite musical style of the moment, which then persisted as a tradition in some pocket of immigrant descendants. 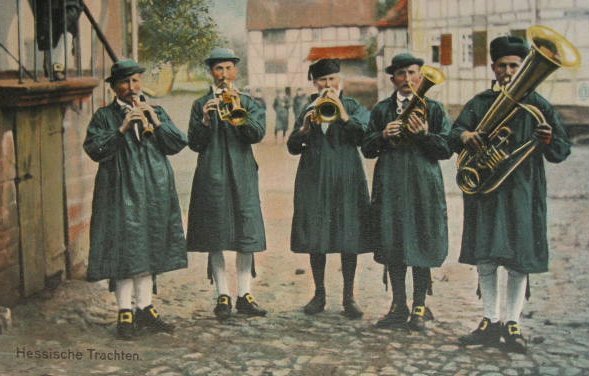 Germans in Germany would, therefore, relate a somewhat different history of musical evolution than Americans of German descent would recognize. The intellectual German Quakers who settled into Germantown in the Seventeenth Century were highly musical, while the English Quakers down the hill in Philadelphia distinctly were not musical at all. There was a central musical feature to the Germantown hermit monks under Johannes Kelpius, their leader, who was a musician of some note. The printing and publishing houses of Germantown spread this music up and down the inland valleys of the Atlantic Coast region so that even after Germantown itself ceased to be the cultural center of things, the Ephrata Cloister carried on. The present center of 18th Century German music is now in the Lehigh Valley. Although Johann Sebastian Bach had been dead for a hundred fifty years before it was founded, the Bach Choir of Bethlehem now conducts the oldest continuous Bach Festival in existence. It's well worth the short trip to Bethlehem if you can get tickets, and more importantly, if you can find a place nearby to park.